Reston, VA – Jan. 15, 2019 –Odin, Feldman & Pittleman P.C. proudly congratulates Alexander Laughlin, Lauren Friend McKelvey, and Nancy Lawrence for being named 2018 Top Lawyers by Washingtonian magazine. The listing, which is compiled by the Washingtonian’s editorial staff, appears annually and recognizes the area’s top attorneys in 20 select practices. 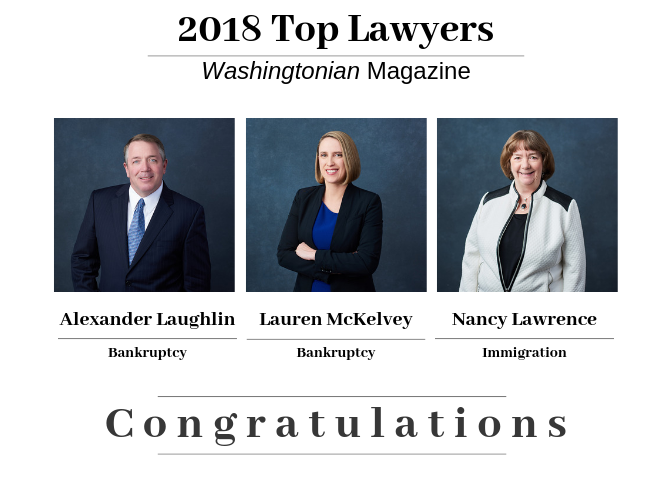 Laughlin and McKelvey are among 14 Northern Virginia-based bankruptcy attorneys on this year’s list, and Lawrence joins only 11 Northern Virginia-based immigration attorneys named in the 2018 listing.